TCM Nutra utilizes the wisdom of Traditional Chinese Medicine (TCM) and herbal medicine research in the manufacture of proprietary herbal solutions to modern health care problems. We are committed to providing the public with herbal formulations that are maximally effective with high safety profiles and no known side affects. 1. 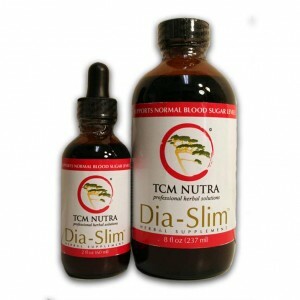 TCM Nutra formulations are condition specific (Dia-Slim for Weight Loss), easy to use, and liquid so your body can absorb it quickly and easily. 2. Our herbal formulas are first water decocted to extract specific active constituents and then alcohol extracted to comprehensively extract lipid based active constituents. 3. Our formulas are subject to rigorous chemical analysis to ensure they are free of heavy metals, pesticide residue and other adulterants. 4. TCM Nutra utilizes organic and wildcrafted herbal and nutraceutical ingredients whenever possible. 5. TCM Nutra herbal formulas are manufactured in the USA in a GMP certified facility. Dia-Slim is our flagship herbal formula for weight loss. Made with organic Chinese herbs and organic herbs from Europe, Dia-Slim is an effective herbal weight loss solution. To learn more about Dia-Slim, go here.